The module is a GUI library that adds interface panel functionality to a Pygame application. The program was initially started as an interface in the Microbe program, and requirement of a user interface in Neural Construct and Replicator Machine programs led to the evolution of the Interphase module. 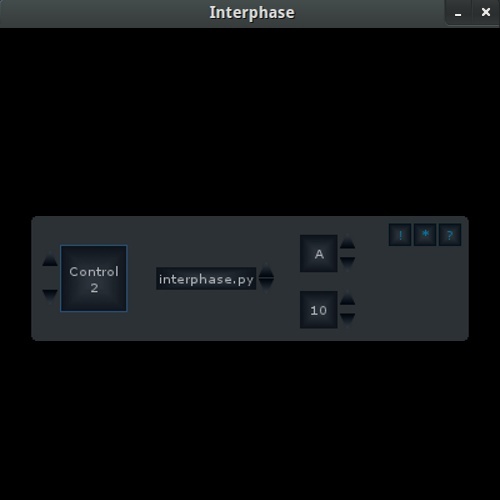 Interphase Pack is a collection of programs that demonstrates the use of the Interphase module, and is discussed in the post Interphase Module Demo Pack. Use 'import interphase' to use the module in your script, or run interphase.py for an interface panel demo. The demo is coded in demo.py, and uses InterfaceDemo that is subclassed from the Interface Object. 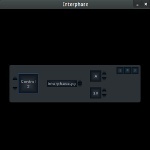 For further information on using Interphase to design a GUI interface panel, see the documentation. The program was written in Python programming language. In addition to Python 2.5+ interpreter, it requires the Python module Pygame 1.8+. The module is also functional with PyJ2D and Pyjsdl. The current version of Interphase is available for download, and the development version at its GitHub repository. Interphase is released under the MIT License.